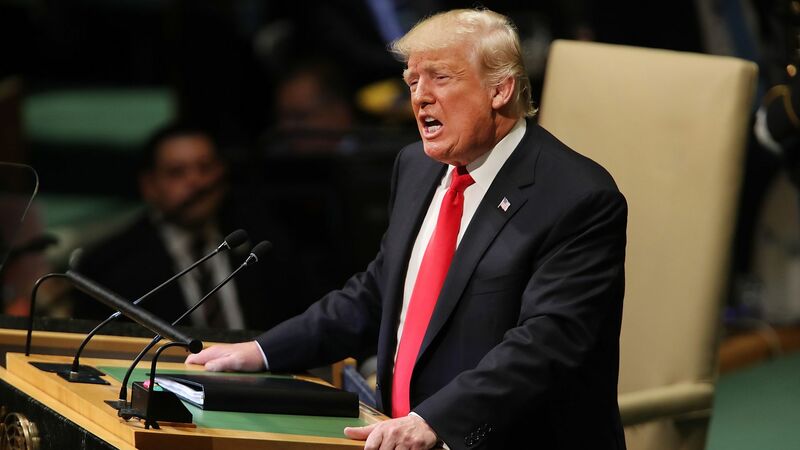 President Trump's speech at the UN General Assembly on Tuesday morning depicted a United States under siege, finally pushing back after years of unfair trade pacts and free riding among allies. Clear warnings were issued: He rejected the International Criminal Court — echoing John Bolton’s speech two weeks ago — and the new global migration compact; from now on, foreign aid would go only to those the secretary of state deems friends. The big picture: President Trump put his America First doctrine forward as a model not just for the United States, but for other countries. He advised them to embrace nationalism over internationalism. The rest of his address hit familiar talking points: boasting about the American economy; praising sovereignty; denouncing globalism, unfair trade, the UN Human Rights Council, OPEC and the Iran nuclear deal; and vilifying China, Iran and Venezuela. Trump set out patriotism as incompatible with globalism, neglecting the reality that many of the challenges confronting the United States this century, including terrorism and nuclear proliferation, will require collective action. Consistent with this oversight, he did not even mention climate change. He also rejected global governance, even though it will be essential to establishing rules for cyberspace conduct, which the United States would benefit from. The principal exception to the dark tone of the speech concerned North Korea’s Kim Jung-un. The president continued to praise him and extoll what their diplomacy has accomplished despite evidence to the contrary. The bottom line: At one point during his speech, Trump boasted that “in less than two years my administration has accomplished more than almost any administration in the history of our country,” a statement that met with laughter. It was more evidence that he has lost his international audience — not just in the UN Assembly Hall today, but around the world.